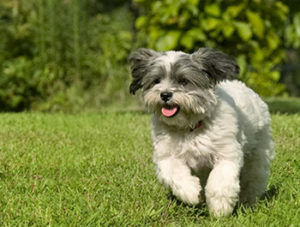 Some dogs are extremely energetic and might not get tired no matter how much physical exercise they get. Mental exercise, for instance hide-and-seek and food puzzles, often make a dog more tired and thus relaxed than just running. In between, make sure your dog has a spot of their own. It can be a doggy bed, their crate, or another suitable place. This place should be the best place in the world; the spot they want to go to. Once you decide on the special place, leave a treat there at random times through the day. Your dog might not discover the goodies at once, but they will eventually, and these treasures will help make the spot special. When your dog rests in the “right” place, stop by with a treat every now and then. If your dog loves to be petted, give extra attention when they’re there. It won’t take long for your dog to figure out that resting in their special spot makes good things happen.